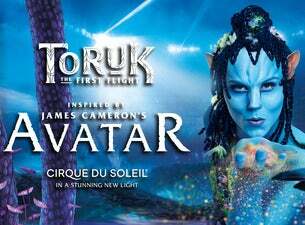 Cirque du Soleil are bringing their touring show TORUK – The First Flight to the UK next year. Inspired by the record-breaking box office smash Avatar, TORUK – The First Flight transports audiences to Pandora in a visually stunning and unique live setting. The live show features creative input from the film’s writer and director, the multi Academy Award-winning James Cameron. The visually spectacular show is unlike any other Cirque du Soleil experience. The brilliance of the performers’ athleticism and acrobatics bring to life the imaginary world of Na’vi. TORUK – The First Flight takes place thousands of years before the events of the film. When a natural catastrophe threatens to destroy the sacred Tree of Souls, Ralu and Entu, two Omatikaya boys on the brink of adulthood, decide to take matters into their own hands. Follow the boys’ adventure as they head out on a quest high in the Floating Mountains to try and save Na’vi from a terrible fate.